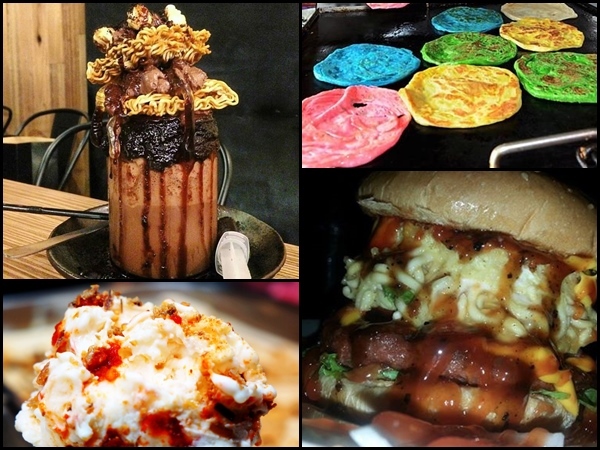 Food is aplenty in Malaysia, that we know. 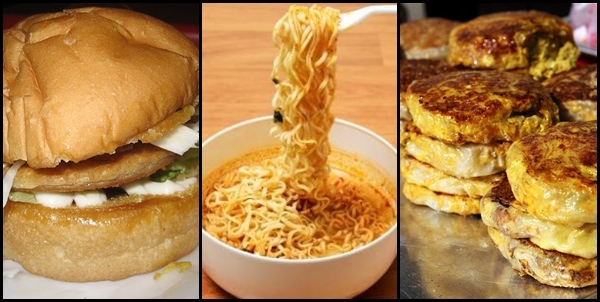 But did you also know that this gem of a SEA country also has some of the weirdest – yet, yummiest – food combos? The combination of a spicy rice dish with a creamy frozen treat really should taste as “delectable” as it sounds but, surprisingly, it really does taste amazing (see? No air quotes this time). And how about dunking a slab of your crunchiest salty snack into your favourite milky drink? If reading that made you cringe while at the same time feel intrigued to try it, then this is the right list for you. Here’s a way to have both your meal and dessert at the same time. 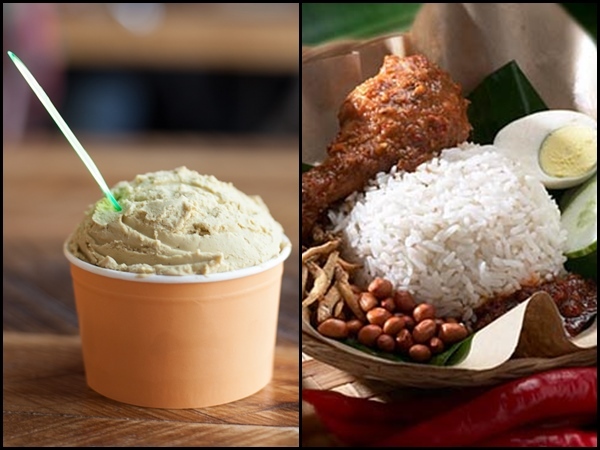 Cielo Dolci’s Nasi Lemak Gelato combines Malaysia’s favourite “fatty rice” (that’s a literal translation of Nasi Lemak) with the smooth Italian frozen dessert. Don’t knock it till you’ve tried it, the coconut gelato does taste almost like the actual rice meal with its sprinkles of chili, peanuts and anchovies on top. Perfect for dessert-lovers who’d want a little challenge. 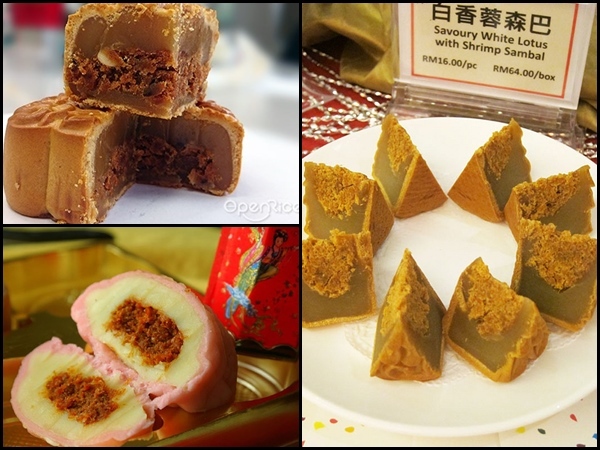 To stand out among competitors every time the mooncake season rolls around, mooncake makers have been coming up with more and more unique mooncake ideas. So we have them to thank for the odd, yet surprisingly tasty, sambal mooncake. Sambal (a spicy condiment indigenous to Southeast Asia) and mooncake traditionally do not go together but there have been variations of this food combo for the past few years. 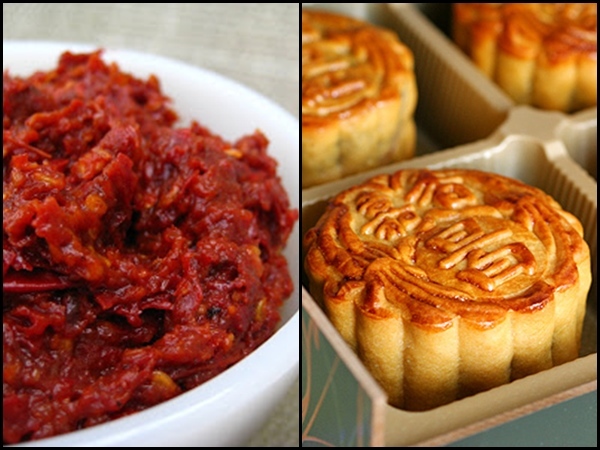 The spicy taste of the sambal mixes well with the sweet taste of mooncake if done right. 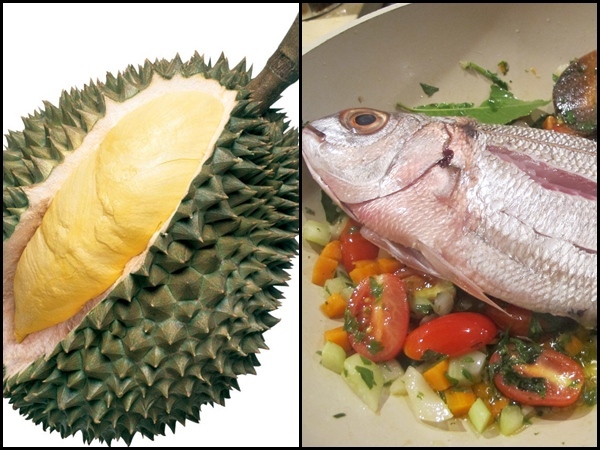 If you’re picturing eating a durian with a fish in the middle in place of its seed or eating a fish with durian flesh instead of its normal flesh, don’t worry, this isn’t as peculiar as your imagined food. 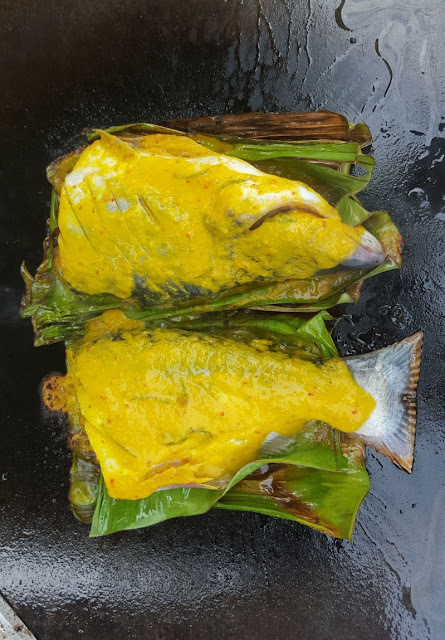 Simply, it is a fish coated in durian – and no, we’re not talking fresh off the tree durian here but a ‘tempoyak’ version of the sweet, but highly pungent, fruit. The fish grilled with the fermented durian condiment can be found at the bazaars come Ramadhan time. Here’s something to wash the food down. 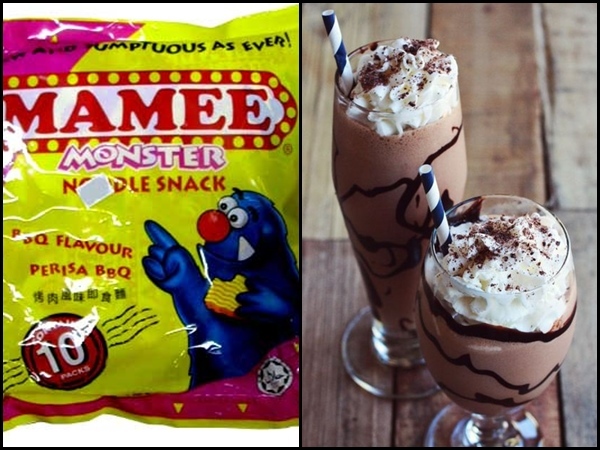 This wouldn’t be the most bizarre drink you’ve ever had, but the feeling of tasting both your favourite crunchy childhood snack while sipping on your chocolate milkshake might be weird for some. 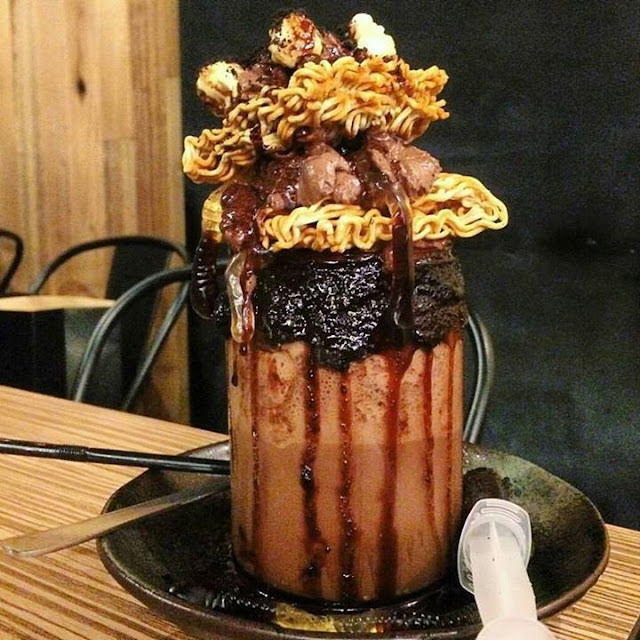 Mamee noodle snack (not the soup noodle version, also known as Maggi – see below) is usually consumed without a side of milkshake but Coffee Société thought “why not?” and introduced this monster just in time for Halloween. Safe to say it freaked some out while some enjoyed its smooth yet crunchy freakishness. Malaysians love their Maggi, so much so they dub every instant noodle by the name. Seriously, go up to any Malaysians eating instant noodle and ask them what they’re eating, 99% the answer will be “Maggi lah!” even if they happen to be consuming a pack of Mamee or Cintan. 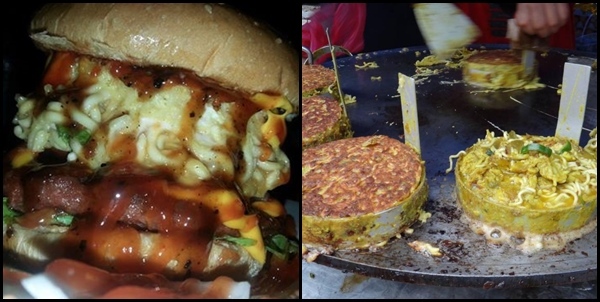 So it comes as no surprise that someone will eventually marry the noodle with other Malaysian favourites, namely the murtabak (stuffed, pan-fried Asian pancake) and burger (there’s a burger stall on almost every street corner in Malaysia). This is one food combo no Malaysian will shy away from. Move aside “Kari? Dhal?”, roti canai has a new pairing. Not so much a combination of two food types but still a very interesting twist as in all of the history of the beloved Malaysian breakfast (typically), no one has ever thought of combining the plain-looking flatbread with colouring. 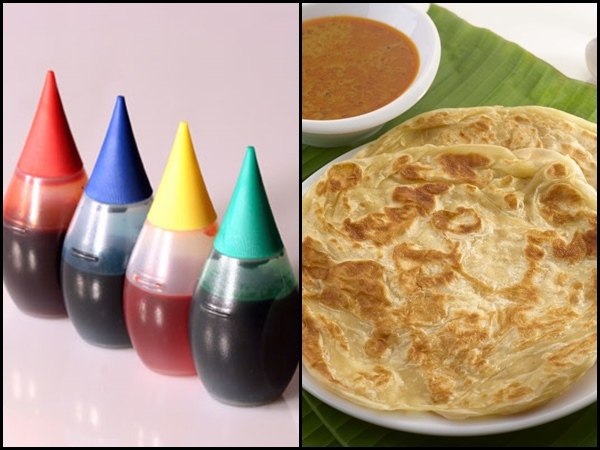 Then again, it could be for good reasons because somehow a blue or pink or red-tinted roti canai suddenly looks more like playdough than real food. Even more bizarre when it ends up tasting like anything but your typical roti canai when flavouring is added in. Still, this rainbow idea seems to be accepted well by customers of all ages. To some foreigners, who discover Malaysian street food for the first time, one of the first questions is often “Why do you fry your fruits?”. We’re not sure…but doesn’t banana (or jackfruit or sweet potato – is this a fruit?) taste even yummier when dipped in a floury batter and deep fried in hot oil? 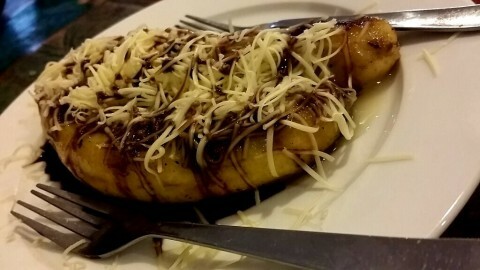 Banana fritters are definitely an unchallenged local delicacy. And wait till you try it covered in cheese! This attempt at Western meet Eastern fusion is a welcome variation to the fried banana snack. The fancier ones even come dipped in chocolate. 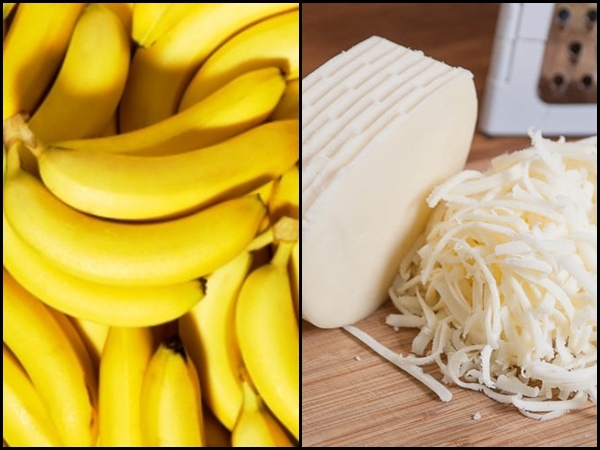 Trust us, cheeseburgers aren’t the only yummy cheesy treat, give the odd banana cheese fritter a try and be prepared to succumb to the art of frying your fruit.